An infertility evaluation is designed to detect problems responsible for preventing pregnancy and is traditionally divided into male and female evaluations. The purpose of this chapter is to discuss the clinical evaluation of female infertility. Causes of female infertility include failure to have or release oocytes, failure to possess a patent reproductive tract receptive to an embryo, or a coexisting medical condition affecting all or some of the above. 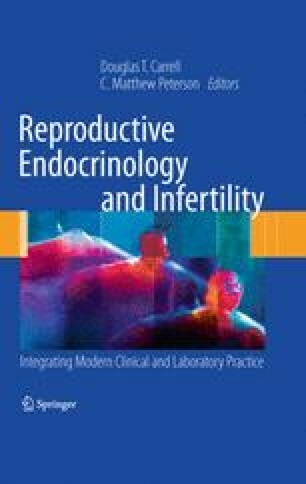 The evaluation to be performed to detect these causes, such as medical history and physical examination, assessment of oocyte reserve, assessment of patency of the female reproductive tract, assessment of endometrial receptivity, and assessment of the abdominal pelvic cavity, is discussed in this chapter. Improvement in the success rates of the assisted reproductive technology procedure of IVF will continue to influence the evaluation of infertility. The balance between the necessity for certain clinical evaluations and financial expenses incurred for the patients must be weighed by both the infertile couple and treating physician.